We've actually read quite a few books this week! We had our whole St. Patrick's Day theme on Wednesday. Faith is starting a biography project which entails more reading and Ben is just on a kick of bringing us book after book after book. Since I had easily 30 books to sort through to pick our favorites of the week, I decided to pick a couple of new ones we read by one of my favorite authors, Robert Munsch. He's a Canadian author whose books are now more well-known in the US, thanks to I Love You Forever, but I remember reading Jonathan Cleaned Up, & Then He Heard a Sound and The Paper Bag Princess in elementary school in southern Ontario. We also used to watch a show called "Readalong" with puppet characters named Pretty & Boot, which is totally unrelated to the book thing, but the elementary school part made me think of it. The other book was a cute one that reminded me of his style, until I looked at the author. Show & Tell - Definitely the favorite around here, because the lead character's name is Benjamin! The fictitious Benjamin takes his little sister to school in his backpack for show & tell, but the baby starts crying and no one knows how to make her stop. Sadie & the Snowman by Allen Morgan - My southern children are intrigued at the idea of building snowmen repeatedly throughout a season. Occasionally, we get enough snow to build a little snowman, but when it melts, it's gone. In the book, Sadie is able to build & rebuild her snowman each time it snows more. My daughter loves to read (when I can get her to ait still)! I'm visiting from MBC. Hi fellow Canadian Mommy. Love Robert Munsch. 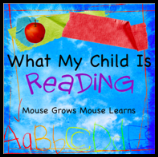 Our kids this week are reading The Lighthouse by Munsch and Love You Forever by Munsch and also Geronimo Stilton Karate Mouse and Wimpy Kid: The Making of a Movie Diary..